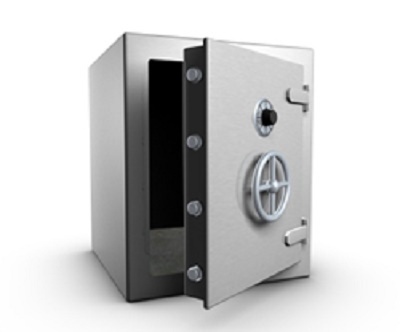 What is the average medical sales rep salary? “How much do med reps earn?” That’s the question the very first MedReps.com Salary Report set out to answer back in 2011. Today, according to the 2015 Medical Sales Salary Report, professionals working in medical sales jobs earn an average income of $141,464, with an average base salary of $80,681. Those figures can vary significantly though, and this report explores how and why. 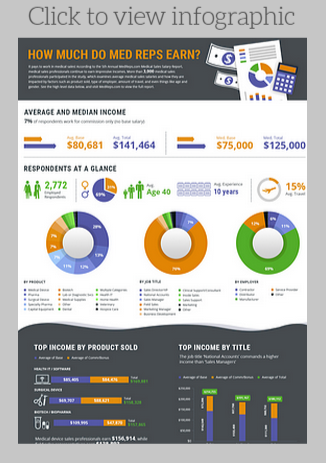 The 2015 Medical Sales Salary Report not only looks at the average income of medical sales reps, but it also details how income is affected by a variety of different factors such as the type of product a medical rep sells, their specific job title, how much they travel, how much experience they have, and even things that seemingly shouldn’t impact earnings, such as age and gender. 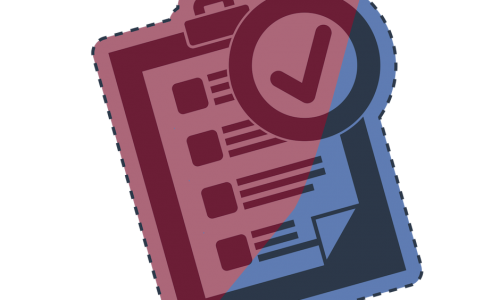 A record-breaking 3,500 medical sales professionals responded to the 2015 survey. 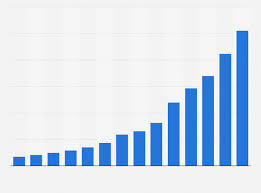 Only complete responses from professionals currently employed in medical sales were counted though, bringing the total number of responses to an all-time high of 2,772. 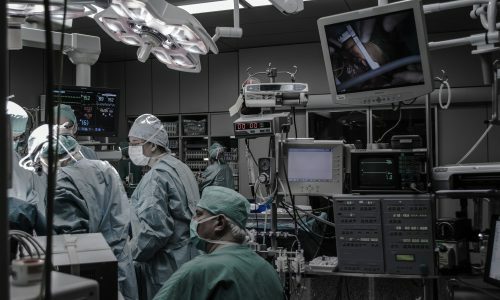 Survey respondents were largely made up of field sales reps (76%) who work for manufacturers (69%), and nearly half of all respondents sell medical devices (28%) or surgical devices (12%). Specialty pharma (11%) and pharma (13%) professionals account for approximately one-quarter of all respondents. In addition to the average incomes earned by medical sales representatives (base salaries plus commissions and bonuses), the 2015 Report also highlights median incomes. Average income values can skew higher due to a handful of extremely high earners, so the median value often more accurately reflects the income of the majority of respondents. 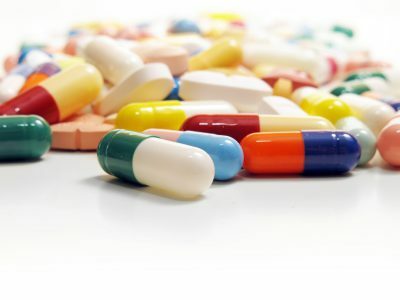 While people outside the industry may only think of pharma reps or medical device reps when they hear the term “healthcare sales” or “medical sales,” for our purposes, the term “medical sales” refers to professionals selling pharmaceuticals and devices, but it also includes those selling medical disposables, lab and diagnostic equipment, capital equipment, healthcare software or IT services – really any product or service sold into a healthcare market. So which products bring in the most cash? In 2015, the top-earners were once again those with health IT and healthcare software sales jobs. These hard-working professionals report an average income of $169,881 (Med. $155,000). 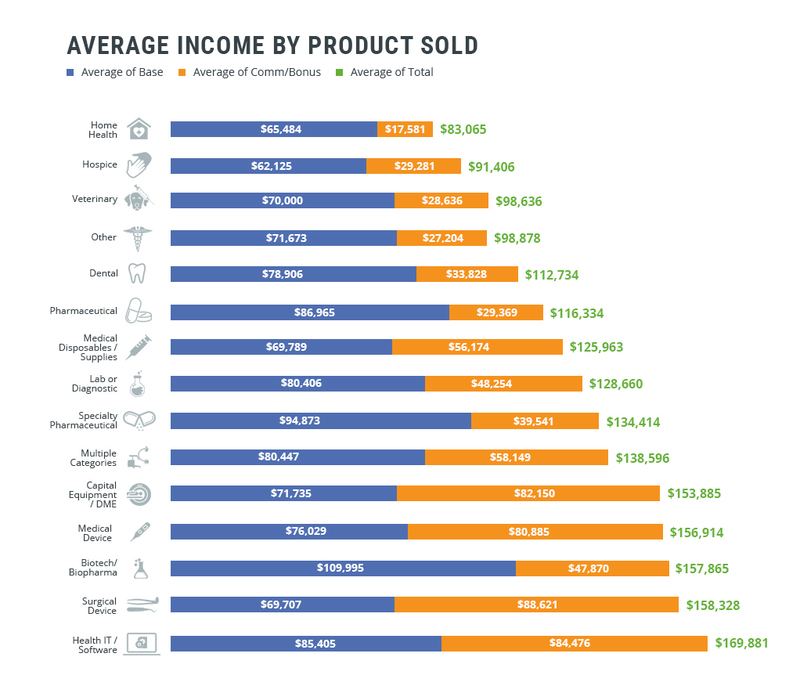 Professionals with surgical sales jobs and biotech sales jobs earned the second and third highest average incomes, respectively, though the median incomes for all three of the top product categories were equal at $155,000. Biotech sales professionals earn the highest average base salaries. For more detailed salary information about the most popular product segments, see our reports covering medical device, surgical device, pharma, biotech, and medical equipment. It’s no surprise that Sales Directors and Sales VPs earn the highest medical sales salaries (Average $214,755, Median $212,500). However, this year, professionals in a “National Accounts” role edged out Sales Managers as the second highest earners (Average $191,167, Median $185,000). Professionals in a field sales role accounted for 76% of all respondents, and this group reported average medical sales representative salaries of $138,893 (Median $125,000). The majority of respondents (69%) are employed by manufacturers. Those employed by large manufacturers earn the highest average total incomes ($152,964), though company size does not appear to impact earnings as significantly as the company type. You might expect those with the most experience to earn the highest average medical sales salaries, but this is not always the case. You may also expect older medical sales professionals to have the most experience and therefore earn the most, but here you’d be wrong. 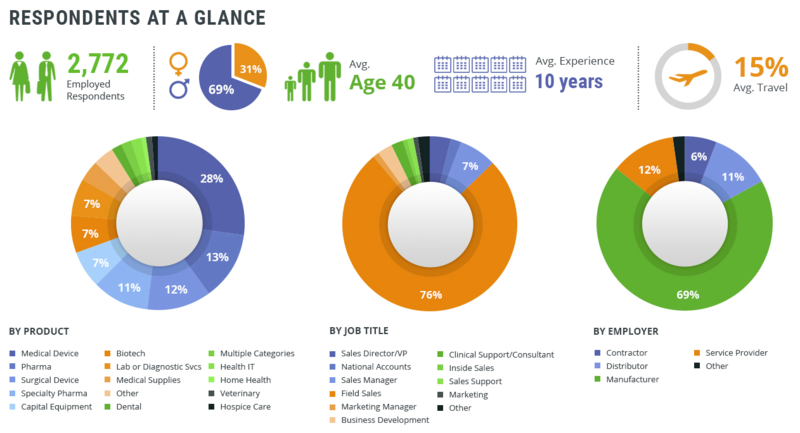 The highest medical sales salaries are earned by professionals in their 40s (Avg. $154,247). While those with 20+ years of experience do earn more than those with less, when experience is equal, professionals in their 40s still earn more than those in their 50s and 60s. 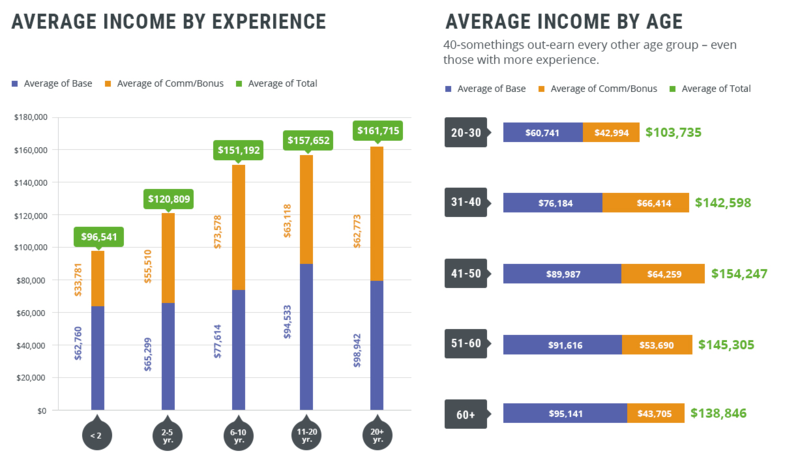 Thus it seems age has more of an impact on income than experience. Gender also appears to impact earnings in more significant ways than it should. Medical sales reps are far more likely to be men than women – 69% of respondents were male – and the average income for female medical sales professionals ($120,271) is just 79% of the average total income for males ($151, 554). Average base salaries are more on par – average base salaries for men are just 5% higher. The fact that men earn so much more in commissions and bonuses is, in large part, a result of the types of products men and women are likely to sell. Women are far more likely to sell the lower earning products such as pharma and home health than they are to sell the higher paying products like health IT and surgical sales. Additionally, women account for just 10% of the highest paying job titles, Director of Sales and Sales VP. That means, for every 10 Sales Directors or VPs in medical sales, only one of them is a woman. Clearly, the glass ceiling has yet to be broken in medical sales. Geography can also impact how much medical sales professionals earn – from how much a medical sales rep travels, to where they live. The results indicate that the more medical sales professionals travel, the more money they earn. Professionals who reported traveling 75% of the time earn the highest average incomes ($163,903), with professionals traveling 50% of the time earning only slightly less ($161,042). Where a rep lives also influences how much he or she earns. The 2015 survey showed the highest average income in Hawaii ($188,750) and Rhode Island ($165,313), however, the number of respondents from these states was not high enough to be statistically significant. After Hawaii and Rhode Island, Colorado, had the highest average total income ($164,261) and accounted for 2.5% of all respondents. South Dakota, Kansas, and Maine also reported high average totals, but the number of respondents from these states was low. See the graph for the average incomes in the states with the most respondents. 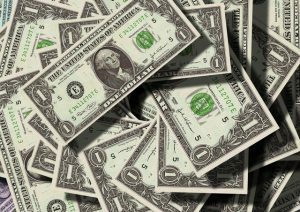 The average medical sales rep salary remains steady in 2015, according to the 5th Annual MedReps.com Medical Sales Salary Report. While total income was slightly up from 2014, the average base salary was slightly lower. 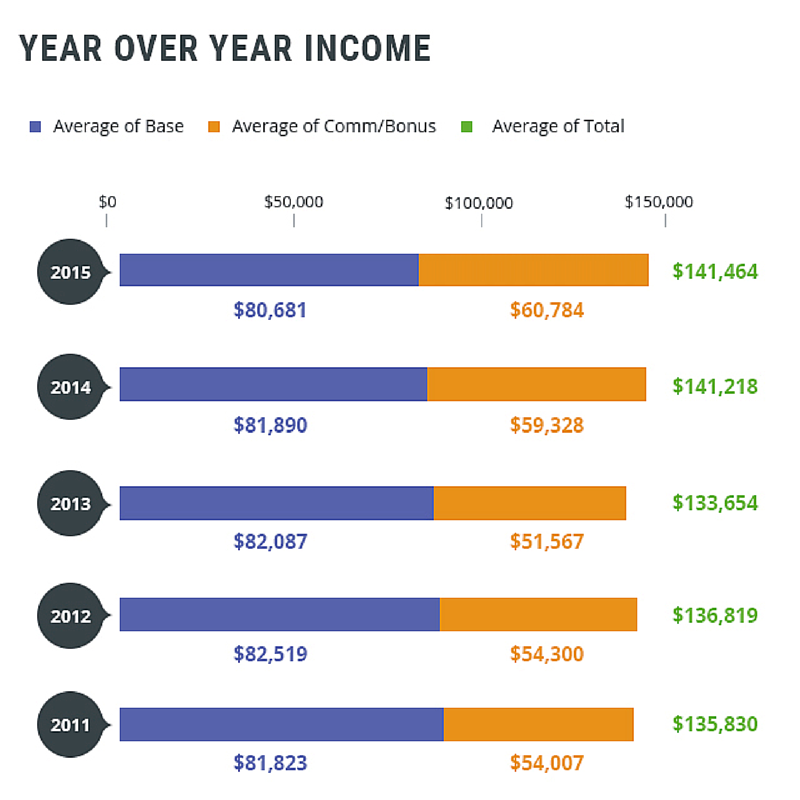 Median base and median total stayed at $75,000 and $125,000 – no change from the 2014 or 2013 numbers. 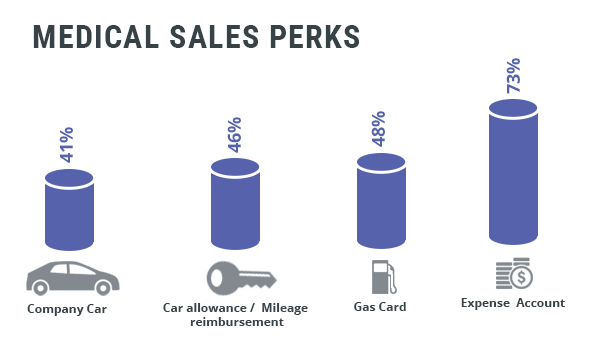 The types of perks available to medical sales representatives are consistent year to year. 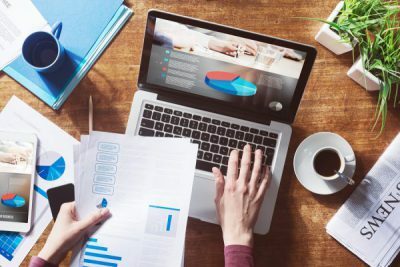 Expense accounts, health benefits and 401ks are very common, as is some sort of automotive benefit – either a company car or gas/mileage reimbursement. Of course, the intangible perks such as flexibility and independence weren’t measured, but we know those are also often cited as perks of medical sales jobs. The salaries and benefits that accompany medical sales jobs are impressive, but do they result in professionals who love their jobs? The answer, for the most part, is yes. 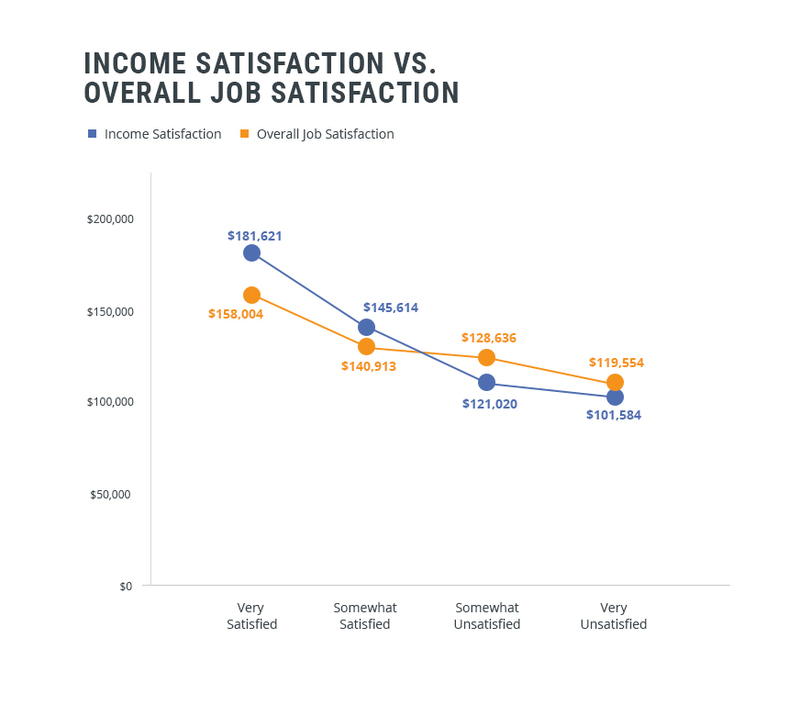 Half of all respondents report being “very satisfied” with their overall job, and the average total income for these very satisfied professionals is $158,004. Another 17% say they are “somewhat satisfied” with their overall job (this group earns $140,913). Approximately two-thirds of medical sales professionals say they are “very satisfied” (20%) or “somewhat satisfied” (46%) with their income. Those who are “very satisfied” earn an average total of $181,621. The 2015 Medical Sales Salary Report confirms that medical sales professionals continue to report some of the highest earnings in healthcare. 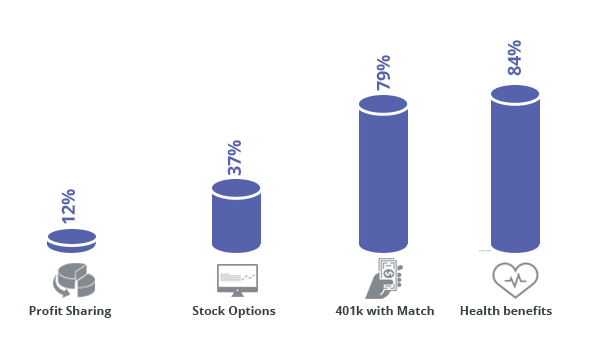 With an average total income of $141,464, medical sales rep salaries are higher than ever, but they can vary considerably depending on the type of product a medical sales rep sells, their job title, what type of company they work for, and more. Medical sales jobs certainly pay well, and the job has plenty of perks, so it’s no surprise that the field remains highly competitive. It takes more than a desire for a big paycheck to succeed in medical sales though. The most successful medical sales professionals are hungry for a challenge and eager to work hard for the significant rewards success in this field brings. For more information on medical sales salaries and the medical sales jobs that pay them, keep your eyes on MedReps.com.